Imagine a scene in a movie. One person is about to give something to another person, and that handoff is key to the success of whatever’s happening at this point (stopping the aliens, stealing the villain’s secret, opening the mystic portal). The thing-to-be-handed-off is important to the first person, and he or she is reluctant to part with it. If the movie’s a comedy: Person One holds out the object as if to let it go; Person Two reaches for it; Person One doesn’t give it up—and a hilarious whispered struggle ensues. If the movie’s an action film: Person One hesitates; Person Two (usually the hero) snaps, “Give it to me, dammit!”; Person One throws it over, angrily. If it’s a drama: Person One looks at the object with sadness and hands it to Person Two with an air of deep regret; Person Two thanks him/her in a heartfelt manner. It’s such a common meme that you know exactly what I’m talking about. Prepare: Before you meet with the employee to whom you’re going o delegate, take some time to define both the area of work you want to delegate and how autonomous this employee should be to start with in doing this work. Defining the area of work will give you a chance to clarify in your own mind the “size and shape” of this responsibility, so that you can communicate it clearly to the employee. You want to define the area as a whole, so that the employee gets a sense of the big picture. Often people make the mistake of inundating the employee with step-by-step specifics when first trying to explain a new responsibility. Remember, you’re not teaching the person how to do the responsibility at this point; you’re simply introducing them to the idea of taking it on. You’ll want to communicate an overall sense of the time and tasks involved; what a successful outcome looks like in this area; the key people involved; and a recent history of the project or responsibility and who’s been in charge up till now. Discuss And Agree: When you then meet with your employee, you’ll first share the definition of the area of work, and make sure there’s mutual understanding and agreement. Then you’ll share your “levels of autonomy” preparation in order to define how the transfer of responsibility will happen over time This is the most critical part of the conversation; be sure to invite the employee’s response to make sure there’s mutual understanding. Finally, you’ll ask the employee to put it all together by creating a written summary of what you’ve agreed. As we’ve learned from countless movies, effective delegation is the single best way for you to share power and authority. In movieland, it means the aliens get defeated, the villain gets foiled, the portal gets opened: the good guys win. In the land of work, it means employees get to demonstrate increasing levels of competence, to which you respond by offering them increasing levels of autonomy. 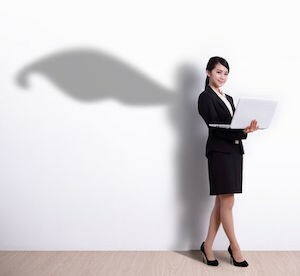 They become more independent and capable, you’re freed to take on new, higher-level responsibilities—and you’ll develop a reputation as someone who is great at unleashing employee potential. When delegation happens well, everyone wins.